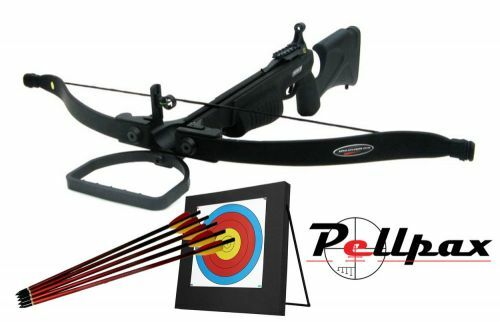 Home » Archery » Crossbows » Recurve Crossbow » Chase Wind 90lb Crossbow Complete Kit! With an innovative compression moulded limb for a fast and smooth power delivery, a precisely engineered aluminium riser and plastic stock, this crossbow is a serious bit of kit which is designed to provide excellent accuracy and easy use. The crossbow has an automatic safety which is engaged when the string is cocked, and the trigger unit has a crisp and clean release on each shot. The whole crossbow stock is coated in a soft coating for a comfortable feel and the black colour means it is well camouflaged. The whole crossbow comes with the Chase Wind crossbow, allen key set, 4 aluminium crossbow bolts, 1 x 1x30 red dot sight, and a crossbow stringer. As well as all of this, you will receive a Foam Target with in built stand, and a pack of 5 x 17inch Crossbow bolts, the perfect combo! Chase Wind 90lb Crossbow Complete Kit!